I’ve been asked by quite a few people since I visited Hopkins, Belize “how does it compare to San Pedro?” Would you recommend the Cayes or Hopkins? It’s a hard question to answer. They are so many differences…size being the most obvious one. And I live in San Pedro and have done for almost 5 years. My visit to Hopkins was two days long. So take all of this with a grain of salt. Here are my opinions and observations. Beaches & Swimming: The beach in San Pedro is white, powdery and quite hard packed. In town in particular, some of the beach is held back by a seawall and you cannot walk right in. Swimming is done either from the beach or off docks (my favorite way to go – there are LOTS of docks). Sea grass blankets much of the sea floor. The sand in Hopkins is darker in color, almost golden, very loose and courser. Walking the long beach is quite a workout (and a great loofah for your feet). There are only 2 or 3 docks so swimming is done by wading in. There is plenty of grass, but not as much. The Water: Ambergris Caye’s water is crystal clear and every possible color of blue. In Hopkins, it is a bit more lake-like, a bit greenish and a bit murkier. I was told that in the rainy season (when I was there), the rivers running from the mountains muddy the water. (I visited the main river running into the sea and it’s true, it was like chocolate milk.) The water is said to be much bluer during drier times. Water Sports: On Ambergris Caye/San Pedro, the reef is the center of activity. Fishing, snorkeling, sailing and diving, you can our reef from the shore. It’s 500 meters away or less, if you are staying on the north side of the island. Boats are constantly moving back and forth and water traffic is quite heavy. The reef at Hopkins is 8-10 miles off shore where the Southern Cayes lie. Snorkeling and diving are more expensive than in AC and the trip by boat is over an hour. Downtown Area: San Pedro town is very developed. There are bars, night clubs, traffic, restaurants, shops, countless supermarkets and more. There is always something going on. Each day and evening, you have a choice of lots of activities from karaoke to beach BBQs to eating contests (see the calendar below). Hopkins, on the other hand, is extremely quiet. The main downtown area is actually tough to locate, the town is so small. When I first arrived on a Monday and asked what I was going on that night, most people were stumped. They told me that Friday was the night to go out. (Keep in mind, it was the slowest season). Restaurants: San Pedro has more but both places have great food. Every meal I ate in Hopkins was delicious. 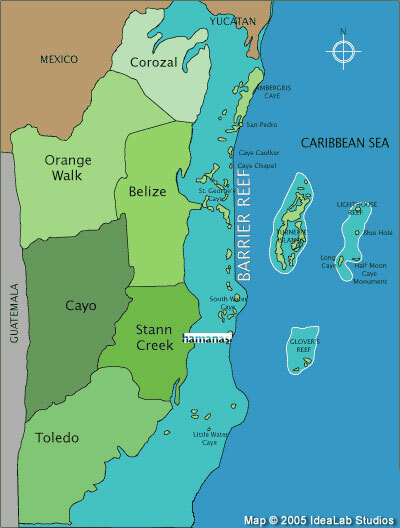 They have seafood, higher end places, Indian, Chinese, local food and, my favorite, Garifuna (we need one of those on Ambergris Caye). Chef Rob’s in Hopkins. A DELICIOUS and impressive four course meal only $55bzd. Prices: Hopkins is cheaper in every way but the snorkeling/diving. Food, drink and accommodations (unless you are at the VERY high end spots) are 10-50% cheaper than San Pedro. Excursions: Jungle excursions require quite a bit of travel from San Pedro. A boat or plane to the mainland, van or bus for an hour or more. In Hopkins, water falls, bird watching, tubing, zip lining and hiking can be as little as a 30 minute drive away. It is a good place to combine the two (sea & mainland sport) from one locale. Learning how to thank someone in Garifuna in Hopkins. The bus for your scenic route to Dangriga. Travel Once You Arrive: Ambergris Caye is so much bigger and much longer. Many drive/rent golf carts when they visit (even just for a day) to explore most of the island. A bicycle works just fine (during the day) if that is your thing. There are also more than enough taxis available. If you plan to stay in Hopkins, no vehicle is really necessary to explore. This place is SMALL! Most hotels have bicycles that you can borrow. Some visitors rent a car if they are planning on exploring some more of the country. Overall Development: San Pedro is much more developed. MUCH more. The population is at least 25x that of Hopkins. Unless you are far south or far north, you are not walking on untouched beaches. You are going to see people, probably lots of them. In Hopkins, I’d guess half of the beach is totally undeveloped. I walked the beach from north to south and back about 4 or 5 times during my trip and saw under five people in total. Population: Many of the residents of San Pedro are from elsewhere in the country or elsewhere in the world. Though there is a small expat population, most of Hopkins residents were born there (or close-by in Dangriga) and you can feel the real sense of pride that gives them in the town and in the Garifuna culture. My bottom line: In my opinion, if you are looking for beautiful water, diving and snorkeling made easily available and the option to eat, drink and party at different places each night, Ambergris Caye is a great vacation. If you are looking to truly get away from it all, you want a very quiet beach as well as relatively easy access to great hiking and jungle activities, try Hopkins Village. Ambergris Caye, the large island by Mexico. Hopkins (marked Hamanasi by the resort) in Stann Creek. All that being said, I have lots more to explore! I need to go to Placencia and Punta Gorda first and foremost. (Toledo is my only unvisited district to date.) I hope to you soon and, of course, will report back to y’all. Great article! Enjoyed the comparisons. Thanks Emily. I’ve got to start travelling more…after Mexico around Thxgiving, I’ve got to go SOUTH! Hi. Thanks for all the enjoyable reading and info. My boyfriend and I are planning a trip to Belize for Feb and are uncertain about where we want to stay. We’ll probably be there for 10 days or so and are torn between Caye Caulker and Ambergris. We’re also planning on a couple of days in the jungle in addition. We don’t want a super busy place but it sounds like Hopkins is a bit too slow. We both dive and snorkel and would like not to be dependent on someone else to be able to snorkel. Are there area you can swim out and snorkel or is a boat required? Do you have any suggestions/thoughts? In Caye Caulker or Ambergris, you can swim out and snorkel off the docks. Often there is coral around the bottom of docks…but the real “show stoppers” are a bit off shore. And you will DEFINITELY want to get a boat out there. It should cost $30-40usd, but make sure you do it. We will be going on our honeymoon in october and staying at the bella vista guest homes in ambergris caye! Will we be able to find a beach to swim at without all the seagrass? We also want to go somewhere to go cave tubing and zip lining sometime on the trip. any recommendations?